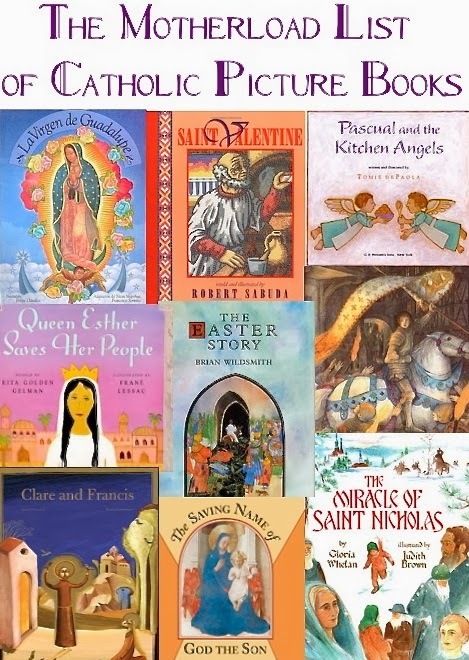 Here is my personal, comprehensive list of excellent picture books that help nurture a love for the Catholic faith and Christianity in general. This is just my opinion, mind you. There are certainly other Catholic books out there but I have been pretty selective in highlighting only ones that I either have or would buy myself. You won't see ugly or inane books on this list; I don't think we should buy/read "twaddle" even if it comes packaged as a "saint story. "No sense in dumbing down the beautiful! However, there are a couple compromises on this point... only because either the pictures or the text are in and of themselves absolutely worth your time. This used to be a post linking you to my Listmania lists on amazon.com but they limit you to 40 titles. 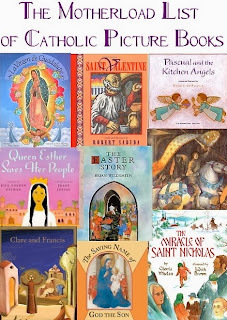 :-) I also left out the entire St. Joseph Picture Books series (which admittedly do have their place, especially being thin, cheap and Mass-friendly), as well as most Christmas books since that genre is too big for my purposes here, another time maybe... I'm interested only in STORY picture books here, that happen to reinforce specifically Catholic/Christian values. I starred *books that are my own very special favorites. Either way, enjoy the list! Thanks for sharing these. Some of them I know, others are new to me. I'll check my library to find out more. Look for the Saints and Me! series for small children from Liguori Publications. A great saint resource written just for the very young! 24+ saints in this 4 set series - with more on the way. Each book is small, short, easy to read and very true to the saint's life. An Alphabet Book for Adults... ? © 2011 Ellie Peck. Simple theme. Theme images by enjoynz. Powered by Blogger.